Last year I attended a fan 'moot' in Belfast during the filming of the Game of Thrones pilot episode. Full reports of that event (including photographs) can be found here, here and here. This year, a second moot was held. Alas, I was unable to attend but many fine members of the ASoIaF fanbase were present, whilst George R.R. Martin and a fair number of the castmembers also showed up. Baratheons united! 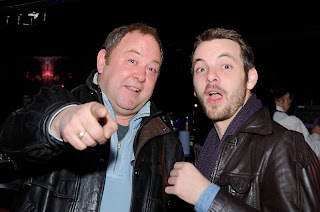 Mark Addy (King Robert) and Gethin Anthony (Lord Renly). Photo by Martin Ellis/Wyvernwood and used with permission. The castmembers who attended included: Mark Addy (King Robert Baratheon), Gethin Anthony (Lord Renly Baratheon), Finn Jones (Ser Loras Tyrell), Miltos Yerolemou (Syrio Forel), Eugene Simon (Lancel Lannister), Kristian Nairn (Hodor), Jamie Sives (Ser Jory Cassel), Kit Harington (Jon Snow), John Bradley-West (Samwell Tarly), Luke McEwan (Rast) and Josef Altin (Pypar). A number of additional extras and behind-the-scenes personnel also represented, most notably producer Bryan Cogman who has been blogging about the show's production here. Fuller reports and many more photos on the experience can be found here, here, here, here and, indeed, here.